This 6 inch round jewelry case is perfect for travel or just storing jewels at home. Choose from white pique or a variety of beautiful moire fabrics for the case then select your favorite satin fabric for the trim and applique monogram. Lastly decide if you want the product to be covered in vinyl or not. Standing 3 inches tall with white velvet lining and 8 pockets along interior circumference, this is a favorite. Pictured on the left are the monogram letters for your review and the fabric colors. Please note, different screens will show the colors differently. THIS LINE IS BEING DISCONTINUED, THE LAST DAY TO PLACE ORDERS IS 9/13/18. This custom made item takes 8 weeks but will last a lifetime so it's worth the wait! 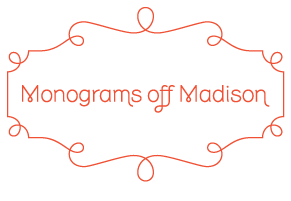 For help with sizes, colors or questions email us at sales@monogramsoffmadison.com or call us at 646 546 5993.